A ketogenic diet is high in fat, with a moderate protein intake and an xtremely low amount of carbohydrates, optimally no more than 20 to 50g per day. When the body is deprived of glucose from carbs for energy, it burns stored fats instead – a metabolic process known as ketosis. Keto Amino features a macronutrient profile to support a low-carb, ketogenic diet while fueling your body with aminos to help optimize your workouts. A potent 12g dose of goBHB™salts (per 2 scoops) supplies ready-to-use ketone bodies for energy. Keto Amino is perfect for men and women following low-carb and ketogenic diets, or anyone looking for an extra boost through their workouts. 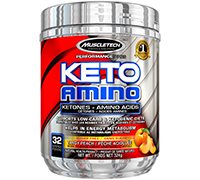 This superior formula uses top-of-the-line ingredients plus a scientifically researched dose of aminos to make Keto Amino the most advanced ketogenic supplement on the market. 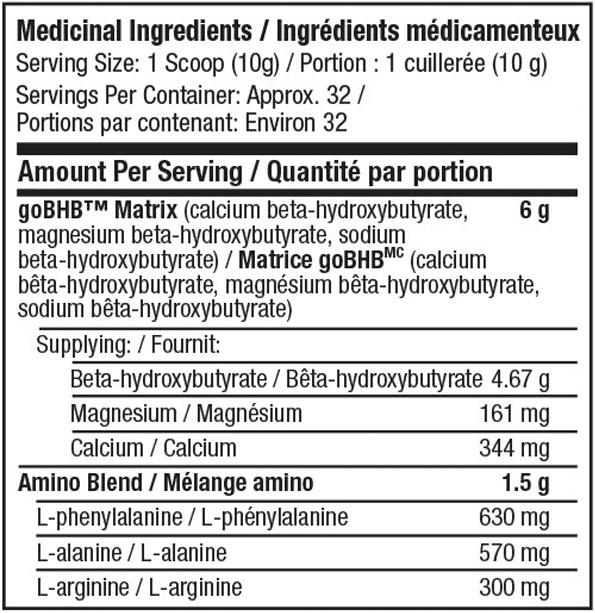 The beta-hydroxybutyrate (BHB) in Keto Amino is a combination of calcium BHB, magnesium BHB and sodium BHB that delivers externally consumed ketone bodies. We don’t hide behind proprietary blends or hide undisclosed amounts of ingredients. Each bottle of Keto Amino is fully disclosed, because we don’t believe in “pixie dusting” ingredients and hiding them in proprietary blends. That doesn’t translate into results! You can trust every MuscleTech® product to be there when it’s time to take your training–and your physique–to new levels, delivering uncompromising potency and power. GoBHB™ is a ketone body consumed externally, as opposed to naturally produced ketone bodies. When eating a low-carbohydrate diet, the body converts fats to ketones, which serves as an alternative energy source. With goBHB™, you’re ingesting a ready-to-use ketone body. Unlike the amino acids that you would find in a standard amino product, Keto Amino supplies a 3g blend of the L-phenylalanine, L-alanine and L-arginine per 2 scoops. Amino acids are involved in muscle protein synthesis and are essential for athletes of all levels, because they aid in the recovery, growth and development of muscle tissue after training.